China (mainland) Guangdong Foshan,1St. Duozheng Rd., Lubao Industrial Development Zone. Sanshui District. Foshan City. Guangdong Province, China. Our phosphor copper anode is manufactured from utmost pure electrolytic copper cathode and most excellent phosphorus using the most advanced international equipments. We use high technologies for copper melting and copper anode producing process, and we produce the copper anode for PCB industry according to the high standard of the same industry in America. By strict test, our product's phosphor content is between 0.04%~0.065%, and it is indicated to be advantaged in fine grain structure, even distribution, free of gas holes or residues, and so on. 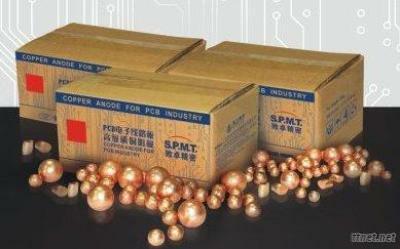 Product quality achieves or even exceeds America Commonwealth Copper Development Bureau Standard CDA, C812, C120 and C122. Minerals & Metallurgy, Copper, Copper/n.e.s.